In this article I will be explaining the difference in financing a condo versus a single family residence. The first and most obvious difference is that each unit shares a building with the other units. In order to maintain the structure that houses all these units there must be an association as established by Florida Law. The rules and guidelines set by the association is for the benefit of all unit owners. This includes the payment of a monthly condo fee to maintain and pay common area repairs and upkeep such as landscaping. In a condo you have limited rights as opposed to fee simple ownership (Single Family Residence) which gives you 100% ownership of the land and all the improvements. Each form of ownership poses different issues for lenders and mortgage insurance companies. Fee simple is the least riskiest for lenders. In a condo the additional condo fee expense is calculated into the borrowers mortgage expenses to qualify for their loan. This fee must be paid every month by the unit owner or the association has the right to foreclose on the property posing another risk to the lender. Should a percentage of owners stop paying the condo fees, the remaining owners would be responsible and may see an increase in the fee to make up the difference. Another item that adds to the risk of lenders are unforeseen repairs such as replacing a roof. The replacement of a roof on a condo structure may run in the hundreds of thousands of dollars and should the association not have enough capital reserves the unit owners would be assesed a special assesment that is an unexpected expense for unit owners. Due to these issues and many others lenders are very careful as to which condos qualify for financing. Fannie Mae the largest investor in the mortgage industry publicizes a list of which condos it will not lend on. This list is constantly being updated. Before a lender approves a loan on a condo they request a condo questionaire to the association or management copmpany that runs that association. This form answers questions the lender needs to know in order to approve the condo for financing such as reserve requirements, percentage of investor properties and if involved in any litigation. Due to the flood of recent foreclosures many condos are no longer qualified for conventional financing and due to that the buyer may need to come up with a substancial down payment and incure higher cost and rates. This link gets automatically updated when the properties go under contractt, new ones come on the market etc. So come back and check this list. A few pointers regarding REOs: They are always 'as is', the bank will make no repairs. When making an offer you need to be preapproved if getting financing; if it is a cash offer the bank requires 'proof of funds' (Bank statements, letter from the bank etc.). 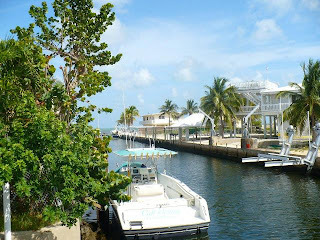 This gives you a great idea about the Real Estate acitivity in the Upper Keys. Click here to see all properties that have gone under contract in the past three weeks (and keep in mind that there are more; many Realtors wait to change the status to pending until all contingencies have been removed). These have closed thus far. I'll find you a great deal that suits your needs and wants! 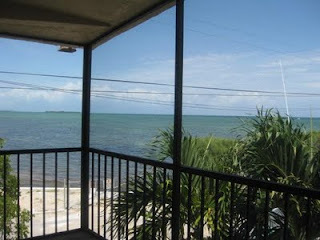 This is a 2 bedroom 2 baths condo in Tamarind Bay for $384,000 It has a great view of the bay and is a ground floor unit. This is perfect if you have little kids; they can walk to the pool etc. This is a great investment. You will not net as much in rentals but the future appreciation makes up for that. 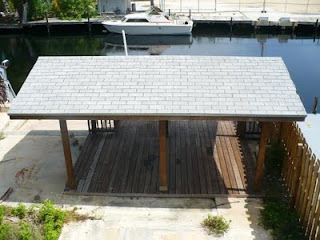 Dockage is assigned, Square footage is 1360 SF, every room has a view. Please contact me for more pics. etc. This is a unique home: a one bedroom home house with 1500SF living space. The top floor is one large master bedroom suite. It's a great deal, that's for sure. Sorry, I just realized that I forgot to post my monthly summary for July. 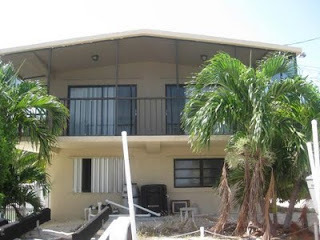 Here is another great deal on Lower Matecumbe (MM76) on the Ocean side. 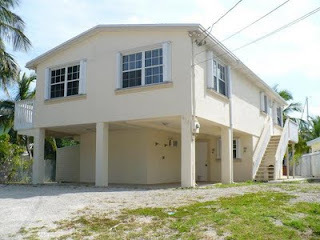 The house is CBS; there are 2/2 upstairs and 1/1 downstairs. The downstairs is on the tax rolls which shoul indicate that it is legal. (in the process of being confirmed). I wish I could buy this! There are some great condo deals out there and they can make for very good investments. 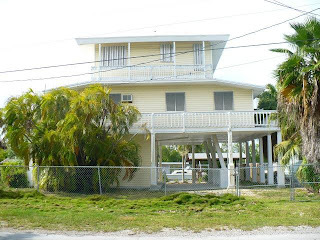 If you have dreamt of a house in the Keys but don't want to spend as much as a canal front house costs, a condo could be an alternative for you. Condos make great vacation homes: The grounds and buildings are kept up by the association and ammenities like tennis courts, pools,dockage, beaches, clubhouses etc. are at your disposal. Following are what I consider the best buys. A lot of good deals get overlooked because they weren't good deals when they came on the market. Since they weren't good deals they didn't sell. They sat and sat and as they sat the sellers of these properties chased the market, lowering their price continuously but never low enough. Many of these properties get forgotten; Some have been on the market for years and nobody pays attention to them anymore. (If it has not sold in two years what can possibly be good about it?). Some sellers maybe did not have to sell two years ago but circumstances might have changed and now they do have to sell. Don't overlook those properties! As a matter of fact most of my sales thus far this year were that kind of property. REO's fly off the shelf when they get listed because they are priced right when coming on the market. There are other properties that are price as competitively as REOs.